Note the following is the script for the video NOT an article, furthermore it might be a bit different to due last minute changes. There is usually also a bit more detail in the script. The script is a summary of James S. Corum’s Article: Defeat of the Luftwaffe (see sources below). The German Air Force the so called Luftwaffe was created in 1935 yet at the beginning of the Second World War it was one of the best air forces in the world. Yet, this radically changed within just a few years. Let’s take a look at the initial situation and at the various shortcoming that ultimately lead to its demise. In 1939 and 1940 the Luftwaffe fielded some of the best air planes of its type notably the Bf 109 fighter that could only be matched by the British Spitfire. The medium bombers Do 17, Ju 88 and He 111 were also good if not great aircraft. Furthermore, the Luftwaffe possessed 500 transport planes and thus the largest air transport force in the world. Combined with the excellent paratrooper units the so called “Fallschirmjäger”, the transport arm was crucial for the early victories on the Western Front. Now, let’s take a look at how this formidable young German Eagle got its wings clipped and ultimately was reduced to a featherless carcass on the side of the road between London and Moscow. The first major shortcoming, was the lack of a fleet air arm. Since the commander in chief of the Luftwaffe Göring insisted that all planes are part of his Luftwaffe, the German Navy was dependent on his willingness to provide proper resources. The Battle of Britain should have not been fought over British air fields, but over British ports and the Atlantic Ocean, because the Royal Navy would have never let the German Army set foot on the British Ilse anyway. Yet, depleting Great Britain of vital resources by effectively disrupting incoming merchant shipping could have force it into accepting a peace treaty. But Germany lacked a naval strike force and proper recon operations to support the it’s submarine fleet. Furthermore, it had developed the air-dropped magnetic mine that was hard to detect. Deployed in sufficient numbers it could have blockaded whole ports or at least increased the losses of shipping substantially. Considering the success of this force of ill-suited planes in small numbers one can only imagine what would have happened with a properly equipped and trained naval air arm. The next major shortcoming was in logistics. The logistical system of the German Air Force was focused on short campaigns. Due to the short effective range of most single engine planes the Air Force usually moved rapidly behind the army and used captured air fields for operations. Usually an air field company could ready such an airfield in about 24 hours. This system was highly effective and allowed the Luftwaffe to fly more sorties than the British and French, thus German air power was basically multiplied. Yet, this support force was very dependent on transport planes to provide supplies. It’s major drawback was that it was a rather fragile and specialized system and not suited for longer campaigns. A major weakness was the lack of proper repair capabilities. Heavily damaged planes were usually loaded onto a truck and transported back to Germany for repair, this put the air planes out of action for a long time. The system also depended on a good infrastructure and road system. This became apparent in the Balkan campaign, when the German Air Force faced major logistical problems due the weak Greek road system and had to rely heavily on transport planes instead of its supply columns- But Greece was small and the distances short unlike the Soviet Union. Furthermore, the war against the Soviet Union unlike the Balkan campaign wasn’t a short campaign at all. This meant that by late 1941 less than 30 of the Luftwaffe forwards air units were operational, while hundreds of planes were awaiting repairs. During the whole war and on all fronts the serviceability rate of the Luftwaffe was 50 to 60 percent. In contrast to the RAF and US Army Air Force which reached around 70 to 80 percent, due to their extensive maintenance and repair system. Whereas Allied planes that limped back to their airfields often could be made operational again the Luftwaffe often couldn’t even repair lightly damaged aircraft in the final years of the war. This became also obvious when the Allies captured Luftwaffe airfields full of planes that were littered with planes that were in various stages of disrepair. 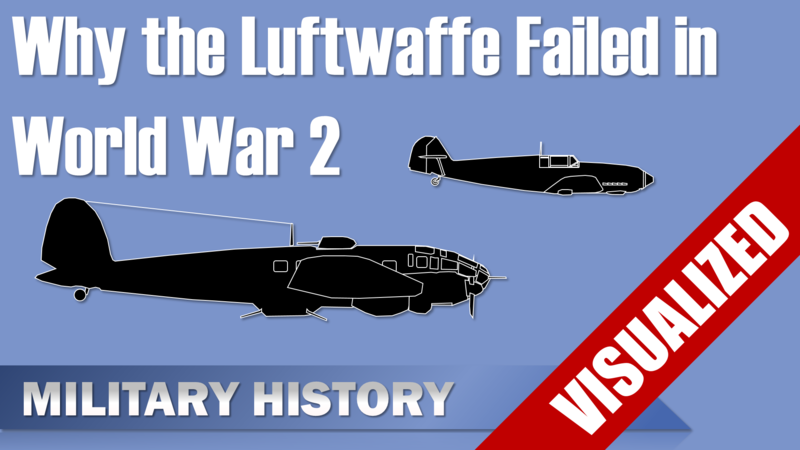 In 1943 and 1944 a third of the Luftwaffe’s losses were planes that had been abandoned on the air fields. I already did a longer video on the Logistics of the German Air Force in world War 2 that covers several other topics, see the link in the description or click on the link above. Another major problem was the mismanagement of aircraft design, development and production. Germany’s aircraft industry was in excellent condition in the late 1930s. During the first stage of the rearmament only mediocre planes were produced, but the second stage saw already the very successful designs of the He111, Do17, Ju87 and especially the famous Bf109. The problem was that Göring replaced the head of the Luftwaffe’s technical office General Wimmer with his friend Udet. Udet was like Göring a world War I ace, but not suitable for overseeing the design and production of aircraft. During the time of Udet German aircraft were either delayed in development, production or of poor designs. Most notably were the He177, the Me 210 and the Hs 129. The only successful aircraft project during his time in office was the FW 190. Another major deficit was the German aircraft and engine industry, it was not structured for a long war. The factories were small compared to the British and American ones, thus they were limited in terms of efficiency. This is clearly reflected by the lower per-worker productivity of Germany vs. the United States or the United Kingdom. Thus, the early advantages in numbers were soon lost. Britain already produced more aircraft in 1940 than Germany. Finally, after Udet Mlich took over, he had experience with the aircraft industry and soon managed to improve the output and efficiency of the industry, but at that time it was too late. Some argue that the German economy was a bad mix between the private enterprise approach of the United States and the command economy of the Soviet Union. Thus, it didn’t possess the focus on efficiency of the States nor the strong direction of the Soviets. In terms of combat effectiveness the Romanian and especially the Finnish Air Forces achieved significant successes with their often lackluster planes against the Soviet Air Force, but Germany for a long time didn’t provide them with proper aircraft instead it supplied them with captured 2nd rate equipment. Thus the existing industrial capacity and sometimes air force personnel was wasted on and in inferior planes. This only changed in mid 1942, when Germany finally realized that the war wouldn’t be a short one. Now, the Luftwaffe also supplied its allies with Bf109s and in late 1942 licenses were granted to produce planes and engines. This failure to support its allies was in contrast to the Western Allies, who managed to build up the almost non-existing Canadian aircraft industry, which provided many excellent aircraft for the war effort. The last and greatest failure of the Luftwaffe leadership, was its inability to develop a proper training System. In the beginning of the war Luftwaffe pilots were well trained and some also had combat experience from the Spanish Civil War. Although Britain initially sent its pilots into combat with less training than the Luftwaffe, the RAF early on introduced a vast training program. Similar the United States began to setup a training infrastructure in 1940. In 1940 and 1941, the average German combat pilot had 250 hours of flight time before entering service, whereas the RAF sent pilots with 200 hours into Combat. In the second half of 1942 this situation almost switched, with 200 hours for the German pilots and 300 hours for British and American pilots. In Mid 1943, the German number was reduced to 150 hours and finally in 1944 German pilots had a mere 100 flight hours, whereas US pilots had around 325 and up to 400 hours of training. To conclude although the Luftwaffe after 1941 fought against increasing odds, its own leadership was responsible for clipping its wings. Although Göring was crucial for the fast rise of the Luftwaffe, he also laid the foundation for its fall by appointing unsuited friends, ignoring the demands of the Navy and demoting highly capable officers to unimportant positions. The once young formidable German Eagle was nothing less than a featherless headless chicken by the end of the war. The video a summary of the article listed in the sources. Except for the numbers of sunk ships by German submarines this information is from the listed website. Note that this number also includes damaged ships, I summed up the values for each month. Previous Previous post: Falklands War – Argentine Perspective – An Inevitable Defeat? Next Next post: How does a Mortar work?